Sponsored post – all travel & accommodations were provided by Jozu For Women. All photos (unless noted) and opinions are my own. Post has been edited as of 4/2/19 to remove outdated content! Jamaica – a place to slow down, explore, engage & enjoy! 3: the state of feeling great. 4: to be at total peace with your current state of being. The way you feel when you have no worries. Jozu is the first of its kind platform that helps women explore, discover, book and experience travel better and safer. Founder Stephenie Rodriguez has been deeply entrenched in the tech world for years and has not only brought her brainchild Jozu to life but she’s also created & maintained, Mighty Media Group, an award winning, integrated inbound marketing agency specializing in digital, mobile, social media communication and strategy. Another key member of the Jozu team is Franz Weathers, Co Founder & Chief Happiness Officer and a Jamaican native. 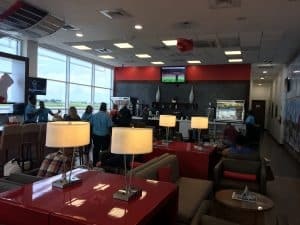 Club Mobay – a uniquely Jamaican, first class lounge experience. 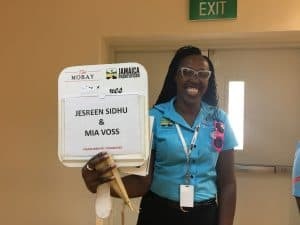 I was greeted by a Club Mobay representative at the end of the walkway, escorted through Customs quickly and then was able to relax, have a drink and get something to eat in their lounge. Everything is complimentary – drinks, food, wifi. Cost for the VIP Departure & Arrival experience is $80 (bundled) and well worth it. I mean like REALLY worth it – you'll need it to decompress when you arrive and console yourself when leaving! Country Country – Nestled on 7 Mile Beach, Country Country has cottage/bungalow style accommodations & includes a pool, restaurant, bar & plenty of private beach. We absolutely LOVED this hotel – perfect for a group gathering. 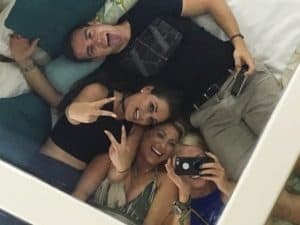 We all had our own balconies/porches in our respective bungalows so we could go off on our own for privacy & then also meet up, share, commune, drink wine & share each of our experiences during the trip. 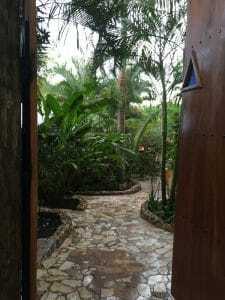 The dense foliage along the paths also created privacy & seclusion. The onsite pool was small but did the trick if you needed a break from the beach. The hotel also has a restaurant & bar – what else do you need? 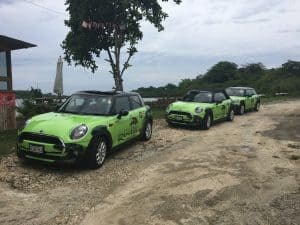 Island Routes – this is a GREAT way to get to know the island Island Routes, an adventure company specializing in Mini Cooper car tours. It was my first time driving on the other side of the road – I'll admit, it took some getting used to! 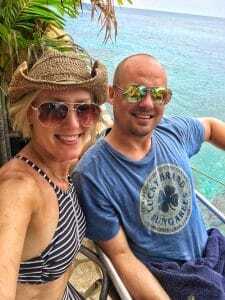 We spent the afternoon driving from Montego Bay to Negril & check out some great spots which included an authentic Jerk Chicken spot, a coconut & beer stand, Ricks (hello cliff diving), Jimmy Buffets and the many sights & sounds between Montego Bay & Negril. The countryside is lush & lovely with light blue water splashing onto the cliffs. 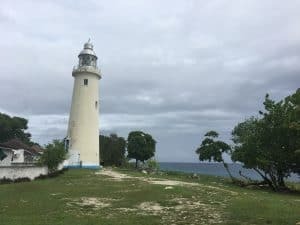 One of my favorite stops was the historic lighthouse – what a sight! Tmrw.Tday Culture Fest – Jozu was also part of the This was a very well put together event, considering it was their first! It was wonderful to meet up with so many like-minded travelers & locals. Festivities included yoga & meditation sessions on the beach with various yogis, artists & vendors, and playing Dominoes with the locals. One of the highlights of the Culture Fest was meeting David Avocado Wolfe and his team. In addition, there were concerts (Protoje), classes and more. 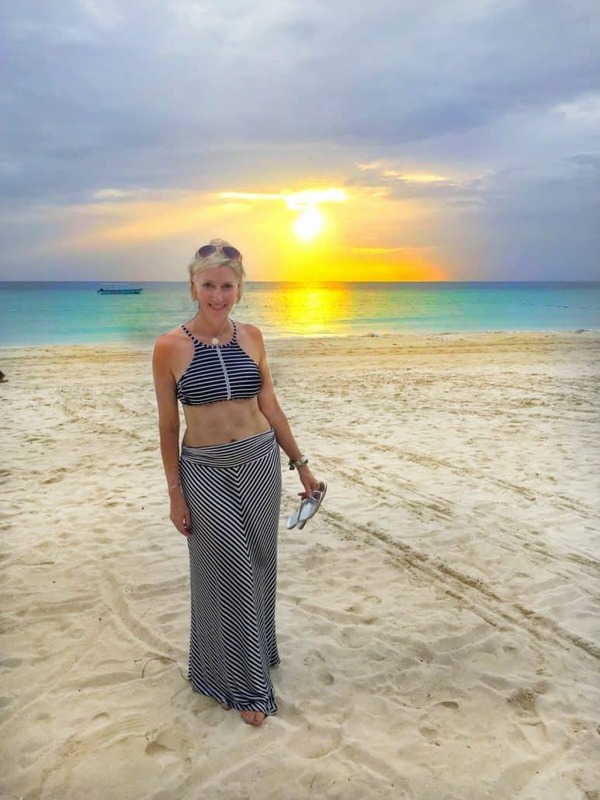 Sharon Feanny – if you are going to be in Jamaica – you MUST meet her! 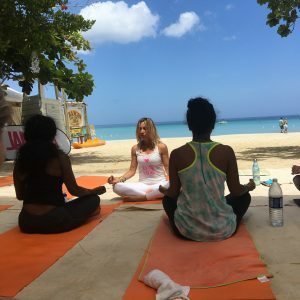 Yogi and gentle soul, Sharon is credited with bringing Yoga to mainstream Jamaica! We attended several of her classes & also had a chance to visit with her and her husband. Sharon was one of the many impressive local entrepreneurs. 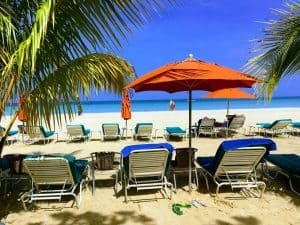 Sandy Haven Resort: Another lovely spot located on 7 Mile Beach – a exclusive boutique resort built in modern urban style set on the famous 7 miles white sand beach location of Negril with 35 units of luxury guest rooms and suites. 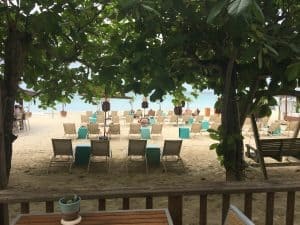 We loved sitting down with the owner & manager and hear how they created an exclusive space on the beach and their passion & commitment to Negril, the community, their staff and clientele. 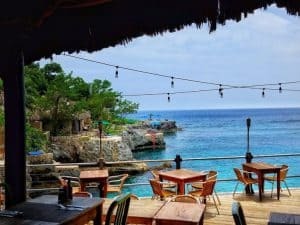 Rockhouse Hotel / The Rockhouse Restaurant & Bar, Negril, Jamaica – The restaurant has one of the best views & their food is fresh, local and amazing. We look forward to exploring this spot more in the future as the hotel has rooms with ladders that go right into the ocean! There were cliff jumpers to watch and you can swim to other platforms to jump in yourself. If you do go in the water, watch out for sea urchins! Wine With Me, Jozu planned a “Little Black Dress” event at this lovely new wine bar & restaurant owned by Cecille Levee. Cecille and her husband Kevin are both power partners in the community and Kevin is one of the owner / operators of Hedonism II, located on the island. 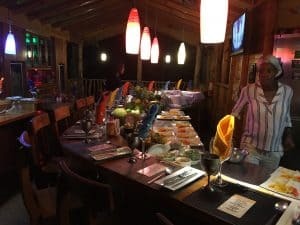 We were served amazing local food & dined with other Jamaican business leaders who drove from MoBay and Kingston to meet us – mainly all women who hold influential positions here and in other cities across Jamaica. It was a powerful room to be among these impressive women and hear their stories. Of course we had to visit once we met the Owners! Jozu planned a lovely dinner for us at the Resort. It's quite a fabulous dining experience at HII – their Executive Chef and Executive Sous Chefs were both awarded the Best Cuisine Awards in Jamaica in 2016! Chief Pleasure Officer Michelle Facey and Lethan toured us around the facilities and we were incredibly impressed. It's a very well-run establishment – incredibly professional. The grounds are quite sprawling & a perfect place for a vaykay for the lifestyle-minded. Yes, there were mirrors on the ceiling of the hotel room we toured. So of course, we had to take pics! 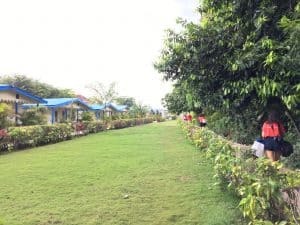 Travellers Beach – A 7 Mile Beach quaint hotel that also has an educational giveback program called NEET aka Negril Education Environment Trust. Our group participated in painting brick blocks with the children onsite and also donated books. 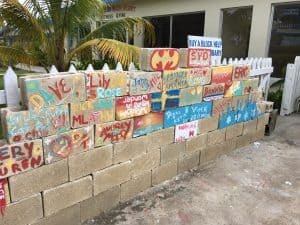 If you are in Jamaica, you must stop by – it’s $10/person to paint a block and the funds help build their library. 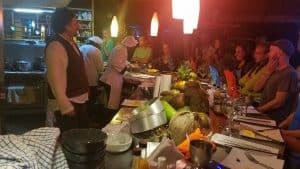 Zimbali Retreats – One of the highlights of the week was a Farm-to-table dinner hosted by David Avocado Wolfe as part of the Culture Fest. It was held at Zimbali Retreats owned by Mark and his wife, a native Jamaican and practicing Rastafari. She and her staff are amazing cooks and David Wolfe treated us to one of his salad dressings made right before our eyes with fresh ingredients. This retreat is a bit tricky to get to but it’s a trip worth taking. A couple of miles up you see the sugar cane fields and farms. As the elevation changes you arrive at the Retreat. 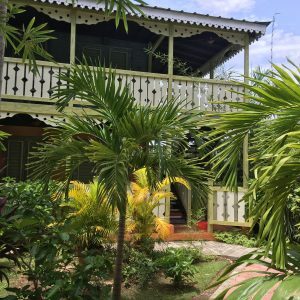 Huge double doors open up into a rustic and cozy wood finished villa with 3 bungalows, a wide open kitchen and nooks to visit and enjoy authentic Rastafari meals and an after dinner joint. Their countryside is full of medicinal foliage, cacao, water springs, and fruit trees. We flew into Montego Bay (aka Mobay) which is a fairly busy city. I was much more fond of Negril & 7 Mile Beach which is laid back and more suited for beach goers. Transportation – because Jozu made sure we had transportation via a private car, I'm not really sure what the situation is with cabs but you should definitely check with your hotel to see what they think is the best option in your area. Except for walking on the beach, it's not really a pedestrian friendly spot for getting from place to place. Big shout of thanks & appreciate to the Jozu team who made our stay in Jamaica incredibly special from the minute we arrived until the moment the jet wheels left the tarmac on our return trip. You definitely need to check out their website and community for booking your next trip! Jozu is the first of its kind platform that helps women explore, discover, book and experience travel better and safer. Have visited Jamaica many years ago and I loved it. Now with your pictures and experience I feel enticed to plan another vacation soon! Please let me know if you decide to go back – would love to connect you with all the amazing business owners there! Hope to visit Jamaica someday, these pictures look so alluring. ? It's really that beautiful in person – you must go! First of all, I love the idea behind Jozu! Secondly, Jamaica has been on my bucket list for years. Luckily, my husband and I will be going in 2018! I cannot wait! It look so beautiful! I've been wanting to Jamaica, and this post just made me want to go soon. The photos you took look like you had such a great time here and what you said about the people being chill made me chuckle for some reason. I saved this post coz I find it really helpful. I'll use it as my guide should we go to Jamaica. It really made me chuckle when I was told “slow down, chill!” Usually people think that locals are stopping on the beach to sell them something – not the case, it just stresses them out to see someone stressed! I'm trying to maintain that chillness still. 😀 Enjoy your trip, please reach out to the places I mentioned if you do visit – they are so awesome & friendly! xo. I have always wanted to visit Jamaica, its such a beautiful place to wind down relax and enjoy the heat. I hope you get to visit there sometime! 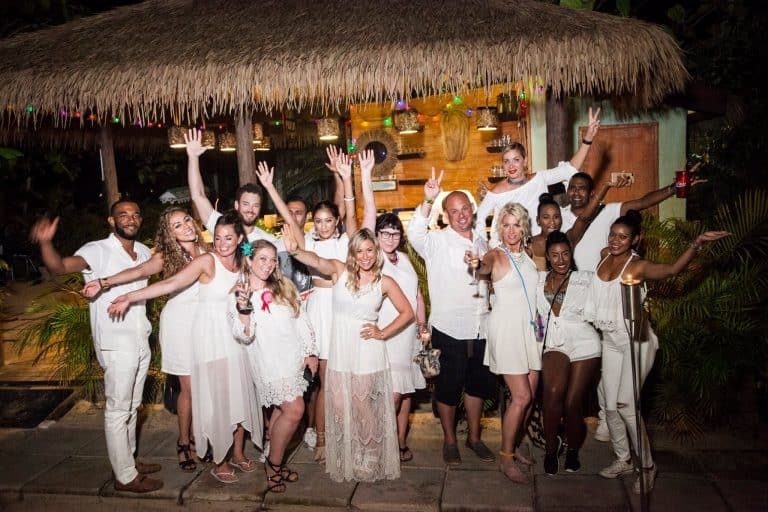 I've never been to Jamaica, but I have a couple friends from there AND I had a friend who had a wedding there (no I couldn't go… valid reason!) anyway! I heard it's beautiful and could also see that in photos of yours and everyone I know who has been there ; ) glad you had an awesome time! Definitely a great place to visit – I can't imagine how nice a wedding there would be! Hope the opportunity arises for you to visit!! Jamaica looks like a paradise! That last picture of you with the ocean behind has such wonderful colours, looks almost unreal! The irie experience sounds like something I'd definitely want to try and to visit the Indigenous Rasta Village, omg, all of these sounds so amazing! It really is paradise! The Irie vibe is amazing and yes, you definitely want to check out the Rasta Village! Hope you go sometime soon. I want to go to Jamaica! Your photos wow! I want to be there now!! Thanks Deanna! Glad the photos inspired you! I have never visited Jamaica before! I have heard so many things about this beautiful place – the people, vibe, and food! I am enjoying your adventure so much! 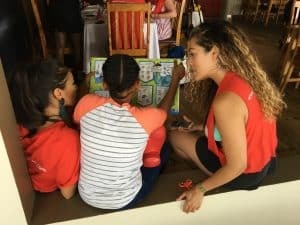 Nice to read about your experiences here in Jamaica. Our island is small, yet so many persons can chronicle different experirences. Thanks for sharing! It’s Salad On The Go at Wendy’s! Lions, Tigers, A Nissan Rogue and a Fort in Northern Colorado!